If you are looking for ways to dress up an outdoor area in your home, you may want to consider setting up a gazebo. They are a practical choice and look really nice. Not only are there many designs and materials to choose from, but because a gazebo has a roof, whatever furniture you will put there will be protected from the elements, such as rain, snow, and exposure to the sun. If you’re planning to buy a gazebo, make sure to check if there are any laws set by your local government that prohibits it. If you’re ready to start canvassing, check out the list below for the things you need to consider when buying a gazebo. Like any investment, you must set a budget for the gazebo you will be buying. First, do your research and check out the price range for gazebos and find a range that you feel comfortable spending. It’s not necessary to buy the most expensive, because the most expensive may not necessarily be the best looking or will fit your needs. If you spend enough time doing your research, you’ll be able to see cheap gazebos that are perfect for your budget and need. Don’t ever make a purchase for a furniture or a gazebo without measuring the exact location where it will be placed. You don’t want to spend hundreds of dollars on something beautiful only to find that it’s too big for your space. Try to create a diagram of your backyard, or whichever area the gazebo will be placed in. Allow enough legroom so that it will not be too difficult going to and from the gazebo. If you already have patio furniture make sure that the gazebo you will buy will be able to fit in all of them inside. There are many types of structure that you can use. There are gazebos that are bigger in size, like the rectangular or square-shaped gazebo. 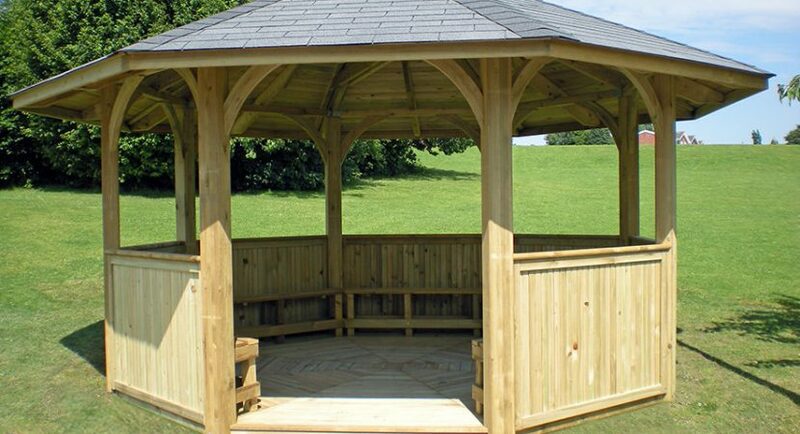 There are also oval, circular or even octagonal gazebos that you can choose. One factor you want to pay attention to is safety. You don’t want a situation where you are with your family in the gazebo, only for the whole structure, or even just parts of it to fall on you. Make sure to find durable materials, so that not only can it withstand the wear and tear of time, but even the natural elements like rain, etc. You may want to choose a gazebo design that will not look out of place when put into the area. You can refer to your house design or even just the colors so that the gazebo will still look like it is an extension of your house and not just randomly placed there.